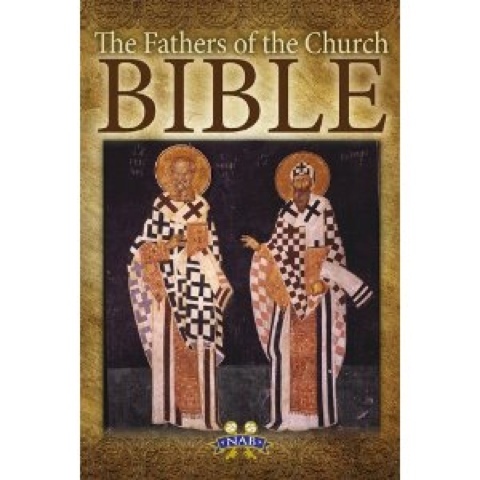 The Fathers of the Church Bible is scheduled for publication on April 25. I think that's one of the drawbacks to using the NABRE translation for a bible like this: required inclusion of the NABRE notes makes it difficult to have a good layout that includes integrated "extra" text. The Little Rock Catholic Study Bible did a very good job, but had to use single column formatting and the result is a very thick edition. It is a big pity, since there are so many opportunities for annotating the text (or since the NABRE does not allow additional footnotes, adding in boxes and sidenotes along the lines of the Little Rock Study Bible). But Bibles including color inserts are, almost without exception, shallow and sporadic in commentary. I've seen Bible study resources that include commentary from Church fathers, such as Eerdmans' Church's Bible series, or IVP's Ancient Christian Commentary on Scripture, or the Navarre Bible series, or Johanna Manley's (Orthodox) series, or even the (overrated) 1859 Haydock Bible; but arguably none of these are readily accessible editions. The Ignatius Catholic Study Bible also references the Fathers. It is true that the Ignatius Catholic Study Bible sometimes engages with the Fathers, but I think that it spends more time explicating the plain meaning of the text and dealing with critical approaches from a moderately conservative Catholic perspective. As a result, references to the Fathers are not present in all passages; thus, if one wants to find traditional commentary on a particular passage, one may get a result more often from one of the resources I listed than from the ICSB. There is a need, though, for an accessible contemporary Catholic study Bible that collects traditional commentary. The Haydock Bible is not over-rated! And I've never heard of the "Church's Bible" series. Could you link to it? A quick Amazon search turns up nothing. I'm familiar with ACCS and the others you mention, and, of course, the Fathers themselves - if you want Patristic commentary, just buy ANF and the two NPNF series. Here is a link to the Church's Bible series. While there is considerable merit in both the ANF and NPNF series, they are organized by author and work, not by verse; so unless one has committed all 38 volumes to memory, they are not the most effective way of finding commentary on a particular Biblical verse. In addition, the translations themselves are quite dated (19th century) and in many cases erroneous. Further, they are incomplete, as there have been additional texts discovered since their publication. Finally, as has been widely noted, the electronic versions (including re-typeset versions) of these 38 volumes introduced considerable additional errors, particular with chapter and verse numbers. I've not found them, on average, any more erroneous than the average Biblical translation, unless you're speaking of text-critical forms of "erroneous" (e.g. possibly translating the "wrong text"), as I believe they're based on Migne, and not a new(er) critical edition like the Corpus Christianorum. The worst "error" in them is leaving the Stromata of Clement in Latin, and refusing to translate it in to English (I'm unsure of whether this has ever been rectified; I have access to the 1994 Hendrickson photoreproduction). Still... I wonder if there would be a market for a "Commentary Concordance" to ANF/NPNF, which would list, in Biblical (and, for Fathers, chronological) order, the page to be found in the entire set for commentary on a certain verse or chapter, throughout all of the works, including ones that aren't specifically commentary (but contain a good deal of it in any case). I picked up the ACCS again, the volume on Romans - the first time I had it, I used the two (four) volumes on Genesis and the Psalms, and didn't care for it a great deal - and it's growing on me. It seems to be a decent modern catena, although several Fathers are heavily over-represented, and the editor's (Thomas Oden) bias towards what he calls "the ancient ecumenical consensus" leavened with a bit of high-church Arminian Methodism, shows through in the selection of annotation for the volume on Romans - but it is still more helpful than I remember (however, the citations could be vastly improved), especially as a jumping-off-point or memory aid to the Fathers themselves. There is something of a index to the NT in the ANF here; it is worth reading the three paragraph introduction to see some of the problems the compilers had. It seems that as course textbooks, for example, these older translations are out of favor. For example, I have never seen anyone assign a book from Augustine or Chrysostom from these volumes; there are just too many good contemporary translations. The popularity of series such as Catholic University of America's "Fathers of the Church Series" (which now numbers 126 volumes!) or New City Press's Augustine series suggests to me that the ANF/NPNF are not seen as adequate. The hypothetical study Bible I was imagining would be accessible to someone who didn't already have familiarity with the Church Fathers. I was also thinking it could include medieval exegetes after Gregory; which of course are outside the scope of the PNCF. I think there would be a real market for such a study Bible. Indeed... it would be many man-years of work to compile such a thing, for one edition alone. No doubt "Fathers of the Church" or "Ancient Christian Writers" are superior translations, and that more texts are now known - the major advantage of ANF/NPNF is in price (the entire 38 can be had for the same price as four 250pp volumes of Origen in FotC or ACW). I had no idea that NCP's translations of Augustine were even new translations, let alone esteemed ones - I bought a volume because it was the only place I could see that had all of Augustine's commentaries on Genesis collected in one volume, in any language.